Isn’t it annoying to always carry a bunch of keys with you all the time? Or getting locked out of your house because you forget to bring the keys with you. To solve these headaches, we created the Ai.One, an ultra smart lock to make life much easier! No need for keys or passwords, just use your fingerprint to unlock your door. 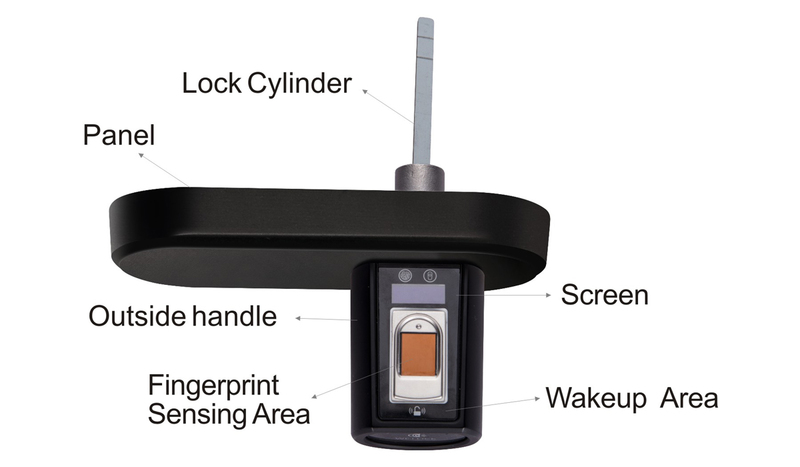 By utilizing the Swedish imported FPC fingerprint sensor and semiconductor biometric fingerprint technology, Welock AI.One can store an up to 999 fingerprints. It can store 3 administrators and 996 other users; plenty of space to give all your family and friends access to your home easily. Forgot to close to the door? Got your hand full with other things? No worries, the AI.One remote control can solve all your problems. Open the door with a single push of a button wherever you are. Connect the AI.One phone app to the smart lock with its highly secured Bluetooth connection. Never get locked out again and always have access to your home no matter where you are. Two features of the Wi-Fi box , unlock the door through your phone when it connects with the Wi-Fi box; Simply connect the Wi-Fi box, when use the Google Assistant and Amazon Alexa. Welock AI.One can not only can let you grant access to others and control the lock through the mobile app, It is also is fully compatible with the Google Assistant and Amazon’s Alexa. Simply say "Alexa, unlock my room" or "Echo, unlock my room"
Pairing your lock with the Google Assistant is one minute. Unlock the door by saying " Google, turn on Welock". Control your door with Google Assistant. The Ai.One will automatic lock the door after a few seconds (5s to 14s) for the ultimate security. Every lock has an unique security circuit board to prevent someone to break it by force. Without required data, no one can open the release the lock even by force. When any attempts of burglary is detected, the app will be locked and delete all data. 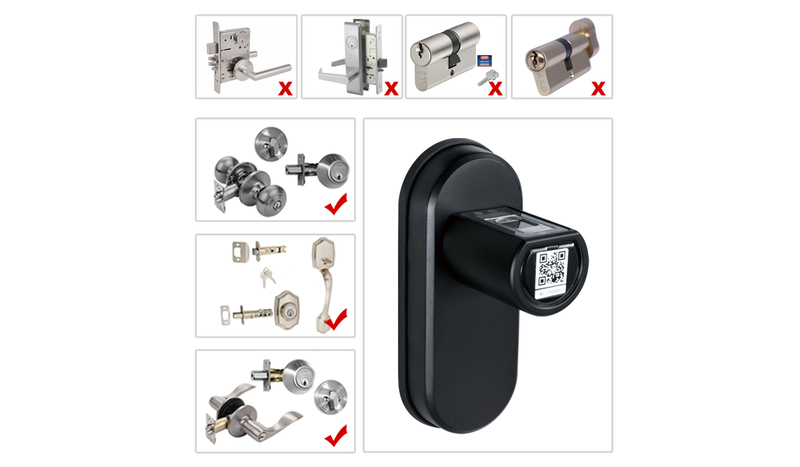 The rotation status of the smart lock does not change without a secured authorization process. The lock can only be opened by the homeowner and approved guests with the archived fingerprints and access sharing. The Ai .One lock has been designed and manufactured with safety as its No.1 priority. Developed for home safety, the Ai .One lock is your first line of defense to protect your home and family. The Ai .One smart lock comes with an stainless steel 304 deadbolt, which is the strongest material used for locks. It has full protection from people as well as weather thanks to its IP44 weatherproof. With its IP44 weatherproof, it can handle all weather conditions and climates. 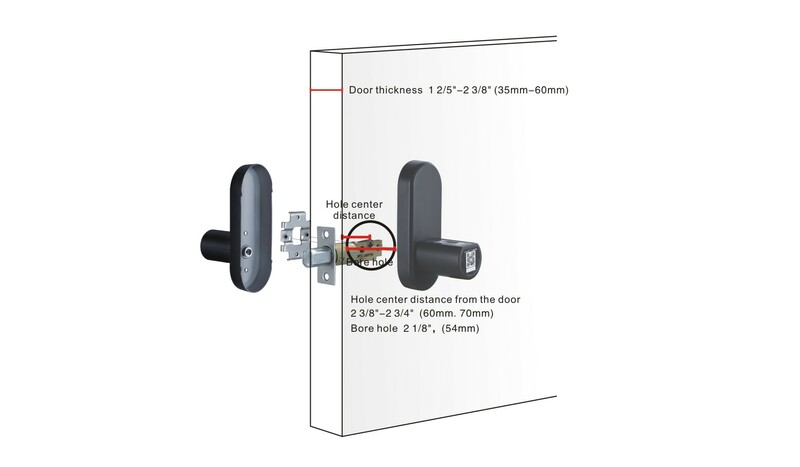 Ai.one Smart Lock will fit on any door with a thickness of 1 2/5"" to 2-3/8" (35mm-60mm) with an industry-standard deadbolt bore hole that is 2-1/8" in diameter. Each lock comes with a small screw driver and some related components with user manual for installing purpose. The dimensions are included in the diagram below to show the actual size of a Ai.one Smart Lock. There are lots of different lock types in the market, confuse what lock matches your door? 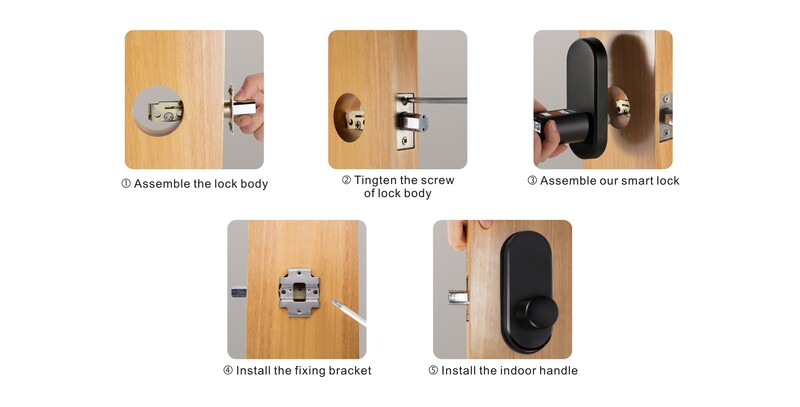 Here is the tips before installing Ai.one smart lock on your current door. Ai.one US standard smart lock always suits for deadbolt and doorknob as shown in the “mark” symbol. You are ready to go and install Ai.one smart lock to replace your existing locks, simply change the new lock with our detail instruction. Welock Ai.one, the US standard, only tool is a screwdriver to change the lock cylinder. The Ai.one ’s simple installation only takes a few minutes.